The Villar SIPAG will take the lead role in the greening of the Philippines. To contribute to the improvement of air quality in the metropolis and provinces. 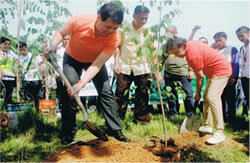 The Villar SIPAG took the lead in the greening of the southern city of Metro Manila. 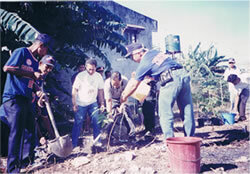 Seeking to transform open spaces in residential and public areas in Las Piñas and Muntinlupa into tree parks, the Villar SIPAG launched “Pagtatanim Para sa Kinabukasan” (Planting for the Future) on April 5, 1992. Since then, over a hundred thousand trees and flowering plants have been planted all over the city. Tree-lined trees, lush greenery in parks and along riverbanks are what set Las Piñas apart from the other cities in the metropolis. Pagtatanim Para sa Kinabukasan has not only beautified the landscape of Las Piñas, it has also substantially helped in mitigating the ill effects of air pollution caused by vehicular emissions. These efforts have not gone unnoticed as Las Piñas has been elevated to the Clean and Green Hall of Fame Awards. Having seen the positive impact of this program in Las Piñas, the Villar SIPAG has expanded its efforts to other parts of the Philippines by donating seedlings to both local government units and private organizations that have partnered with them in this endeavor.